With three new NetEnt slot being launched this month, it is a very busy month when it comes to the NetEnt Games, but you won’t hear me complaining. The more NetEnt slots launched, the better of course as we can never get enough of their games. In two weeks, on the 14th of June, the NetEnt Casinos will tell you a little story, a story Bollywood lovers love to hear over and over again. 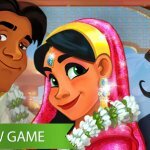 Are you in for a traditional Indian “boy meet girl, family won’t accept their love” story, the Bollywood Story™ video slot will be your kind of video slot. It will be one crazy month with so many new NetEnt video slots launched. As much as we look forward to the Witchcraft™ video slot to be launched, that much are we waiting for the Bollywood Story™ video slot to arrive at the NetEnt Casinos as well. However, I can’t say the same about the third new video slot becoming available at the NetEnt Casinos this month. This new addition involves another branded slot game, inspired by the most dangerous game ever! This high-quality video slot will bring you the most exciting bonus game ever, but be sure you’re aware of the risks as I’m talking about the Jumanji™ video slot here. 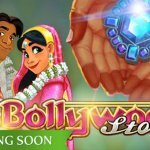 It’s only three days before the Bollywood Story™ video slot launch that one of the most magical NetEnt slots is going to arrive at the NetEnt Casinos. 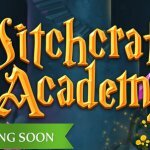 While already available at LeoVegas, it will be from the 11th of June that all players can go on a quest for magic treasures with Efora the Witch and Earthan the Wizard. 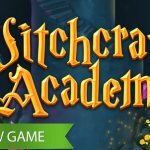 You’ll get a chance to have a look inside the ancient and mysterious school of magic, full of secrets and spells, The gameplay is offering a mysterious concoction of Wild substitutions, Element Bonus, and Free Spins with Free Spins Features. Three days after the Witchcraft Academy™ video slot launch, on the 14th of June, all NetEnt Casinos will start telling the Bollywood Story™ to whoever is interested in this remarkable film concept. Many of the Bollywood stories offer the same format in which the boy meets the girl and the family doesn’t agree with their love. Meanwhile you can expect dozens of songs, lots of action but no bloodshed, and, of course, a happy ending. This same concept has now been used for a NetEnt video slot. 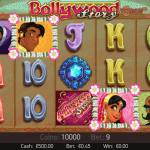 The Bollywood Story™ video slot will bring you all the best of Bollywood, NetEnt and the Lights™ video slot. Why Lights™? Simply because the gameplay is exactly the same as in the Light™ video slot offering Wilds, Floating Wilds™ and Free Spins. And then the 21st of June arrives, the day the Jumanji™ video slot is becoming available. From this moment on you’ll be able to open Pandora’s box with the Jumanji bonus game as the highlight. The Board Game feature is unique and among the first of its kind as it combines elements of the famous board game and Free Spins features. Jumanji™ will be enriched with 4 random features, a Board Game with 4 different Free Spins, a Mystery Feature, coins wins, and extra dice rolls. Based on the original Jumanji movie from 1995, you’ll soon be able to enjoy a video slot inspired the calamities that befell Alan during the movie. A few of them have now turned into video slot features and I can’t wait for this new branded slot game to arrive at the NetEnt Casinos. 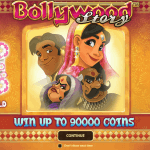 A busy month with lots of new video slot adventures, but first things first, the Bollywood Story™ video slot! It might be obvious that you’ll be treated a typical Bollywood story with this time two young lovebirds completely in love with each other. Nothing more beautiful than a young couple in love. Except, that the young love isn’t accepted by their families, something very common in India thanks to the caste system. 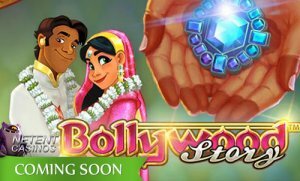 The Bollywood Story™ slot features Free Spins and Floating Wilds, a combination of slot features I’ve seen before in the Lights™ video slot. It seems that NetEnt is giving this particular gameplay another try in combination with a different theme. However, I’m not sure if it is Bollywood that will attract more players, but with video slots you’ll never know.